Donnelly was a placekicker and punter in college who averaged 47.5 yards on 63 punts as a senior in 1984 while also connecting on all 30 of his extra point attempts and three of six field goals. Undrafted by the NFL, Donnelly signed with the New England Patriots as a free agent in ’85 but, unable to unseat Rich Camarillo, was picked up by the Falcons. His rookie season ended prematurely due to a knee injury. Falcons went 4-12 to finish fourth in the NFC West. 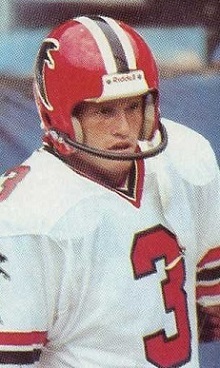 Donnelly spent three more seasons with the Falcons and led the NFL with a 44.0 average in the strike-interrupted 1987 season. His hang time improved in ’88, but a back injury cost him the entire 1989 season. While he returned with the Seattle Seahawks in 1990 and averaged 40.6 yards on 67punts, he was placed on injured reserve three games into the ’91 season and further back surgery ended his career. Overall, Donnelly averaged 42.1 yards on 376 punts, with 296 of those punts for a 42.6-yard average coming with the Falcons. He was twice a second-team All-NFC choice by UPI.